Weather: Another beautiful day! Sun, a few clouds, temps in the high 60’s. What a welcome change from the sweltering heat, and humidity of the past week! Watchers: Larry O, Barb, Kathy O, Lisa, Jeanne & Carol P.
It’s time to officially add a 4th Falcon to the Rochester Falcons family. 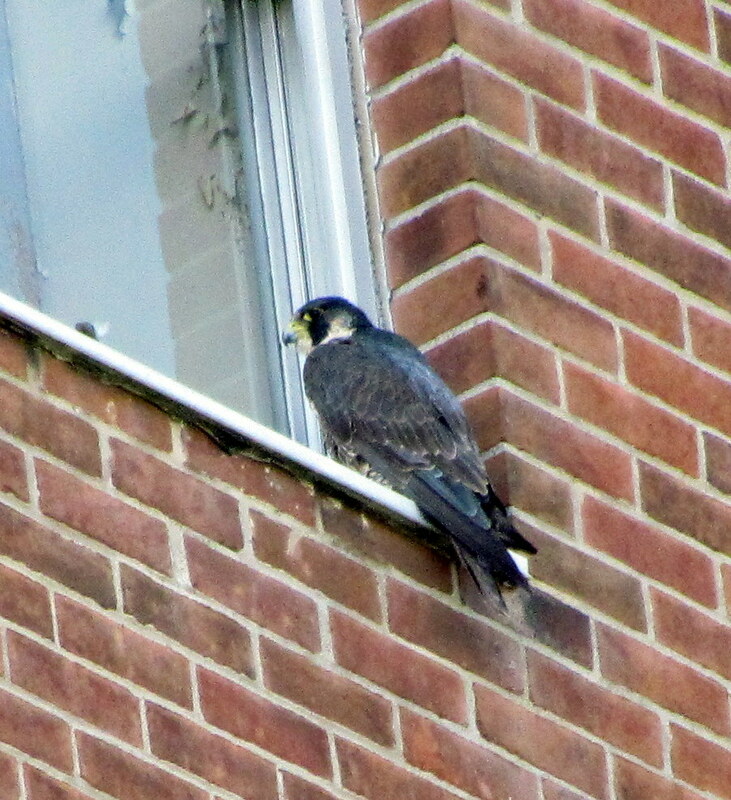 He’s a small tiercel out at KP. I’ve found him out there twice now and there is evidence that he’s been there for awhile. I am pretty sure this is the same bird I saw last Friday, but due to the distance, I can’t be 100% sure. Today I started my watch out at the BS location with a very active Pigott. When I first got there, she was on the east side of the building. She then flew around to the front (north side). I remained with her for awhile before heading downtown. When I arrived downtown around 5:00 pm, Dot.ca was on the eggs and Beauty was, well somewhere. Probably in her secret place. Someday, we Watchers will figure it out. She’s a tricky one! Larry O joined me and then Barb. My on-line Watcher helpers were ezsha, Kris G and Ei. Thank you ladies! It wasn’t until 6:20 pm that Beauty flew up to the TSB and landed on the platform. She remained there until 7:00 pm before letting it be known to D.C. that it was her turn to warm the eggs. 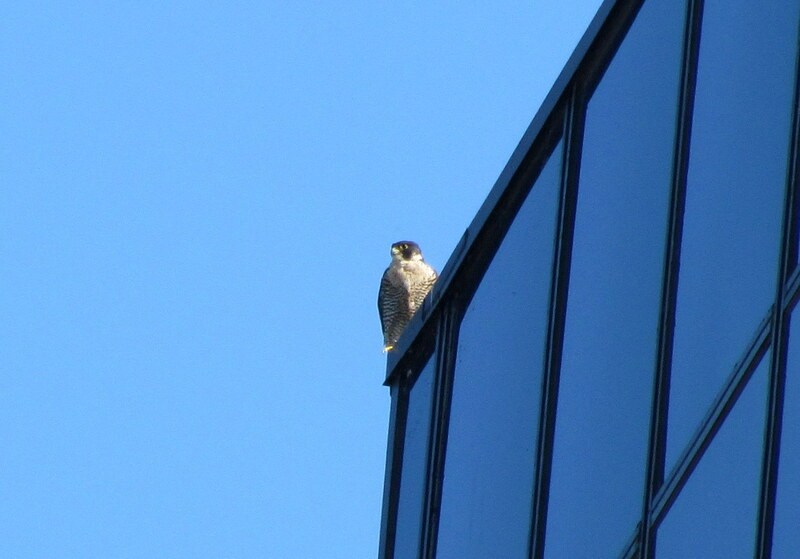 He took off, flew around a bit and landed on the ladder on the Wilder Bldg, a little below the roof level. I said my goodbyes to Barb and Larry O and headed down to Aqueduct St to watch D.C. who was preening every feather he had one at a time. At 7:20 pm he finished. It was time to do some Crow chasing, and that he did. 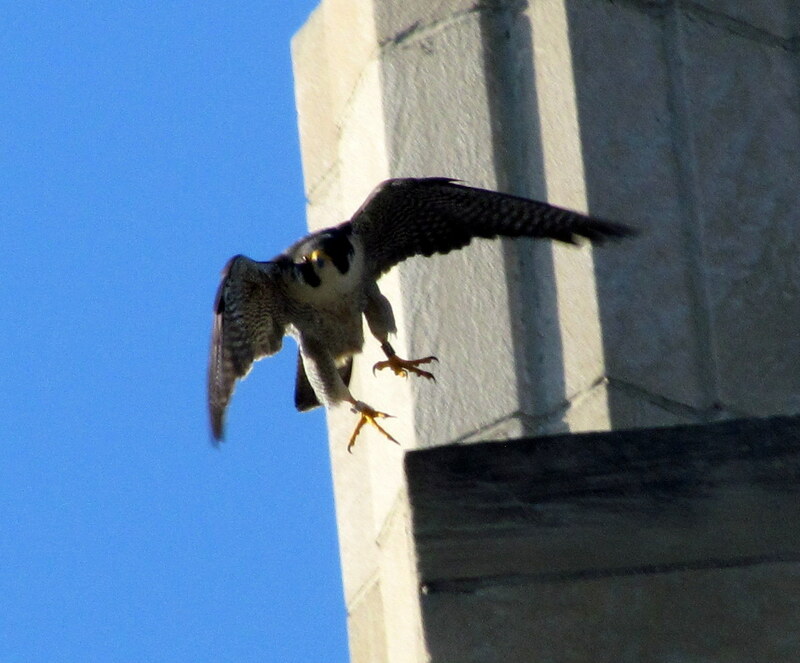 He stooped off of the Wilder Bldg and chased the Crows out over the river. I lost sight of him behind the buildings and did not see him again this evening. I decided it was time to go home after checking the BSB to make sure no other Watchers showed up. Nope. 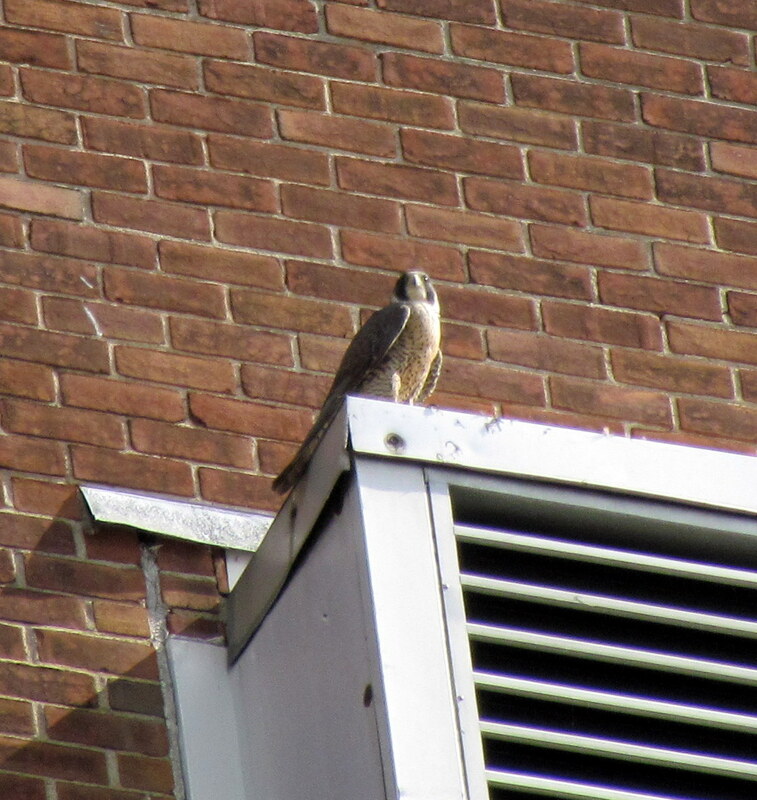 On my way home (7:50 pm), I made my usual stop at KP and was happy to find our #4 Rochester Falcon on the east stack on a railing in front of a red door. 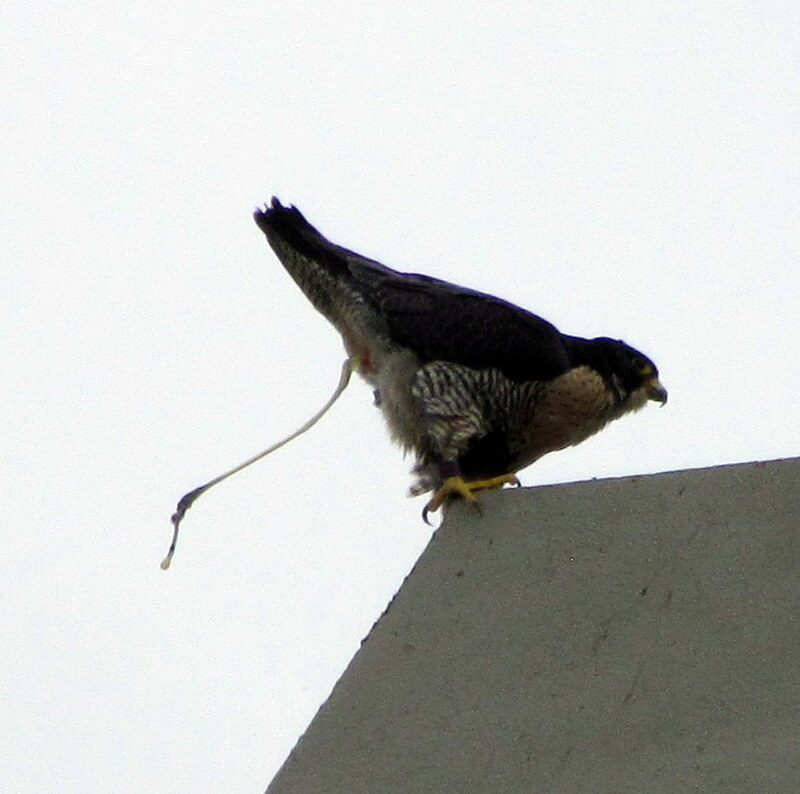 This was the exact spot I had noticed all the white wash (aka Pefa Poop) on the stack and this falcon was in a perfect position to have caused it. He hopped over to a nearby electrical box and stayed there for awhile. 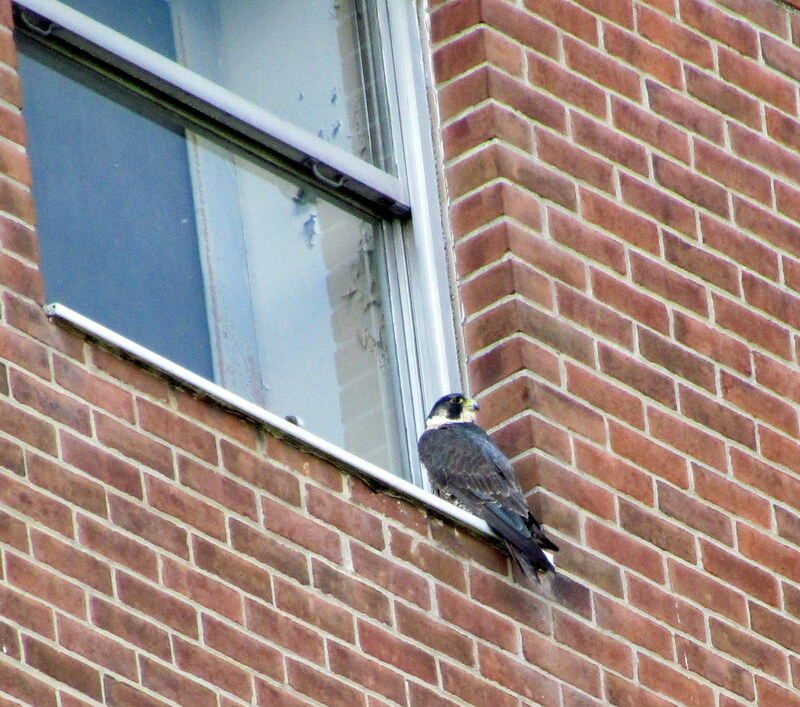 I tweeted out that there was a Peregrine at KP in case anyone wanted to join me. I decided to stay at KP until dark, just to make sure there wasn’t a 2nd falcon there. There wasn’t. At 8:15 pm, KPT (KP Tiercel) took off heading east. Strong, quick wing beats. I jumped out of my car for a better view as he went further east. Then he stooped and I lost him. Back up into my view and he circled back, but he wasn’t alone. Two Crows were following. That didn’t bother our KPT. He headed back towards the stacks and then did a “U” turn. Now he was chasing the Crows! Another “U” turn and the Crows were chasing him! Another “U” turn and he was chasing the Crows? You get the idea. He then headed back to the east stack, minus the Crows and landed on the back (north side) of the catwalk. While I moved my car in the parking lot to get a better view, he took off and landed and took off and landed , finally on an arm that juts out from the east side of the stack and this is where he remained until I left at 9:30 pm. Before I left, Lisa McK and Kathy O joined me. It was their first time seeing him. The sun set and it got really cold, so we all decided to call it an evening. Oh, and during our Watch, we received a tweet from Jeanne that she had 2 Falcons over at the BS location and they were vocalizing. I guess we have to assume that it was D.C. visiting Pigott. 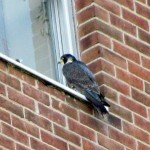 So, FOUR Rochester Falcons seen today. A very good day indeed! This is just another good reason to keep your eyes to the sky! 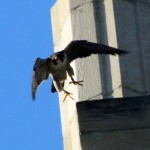 I got picked up just before 9:00am by fellow falcon watcher Lynda. We headed downtown straight away. 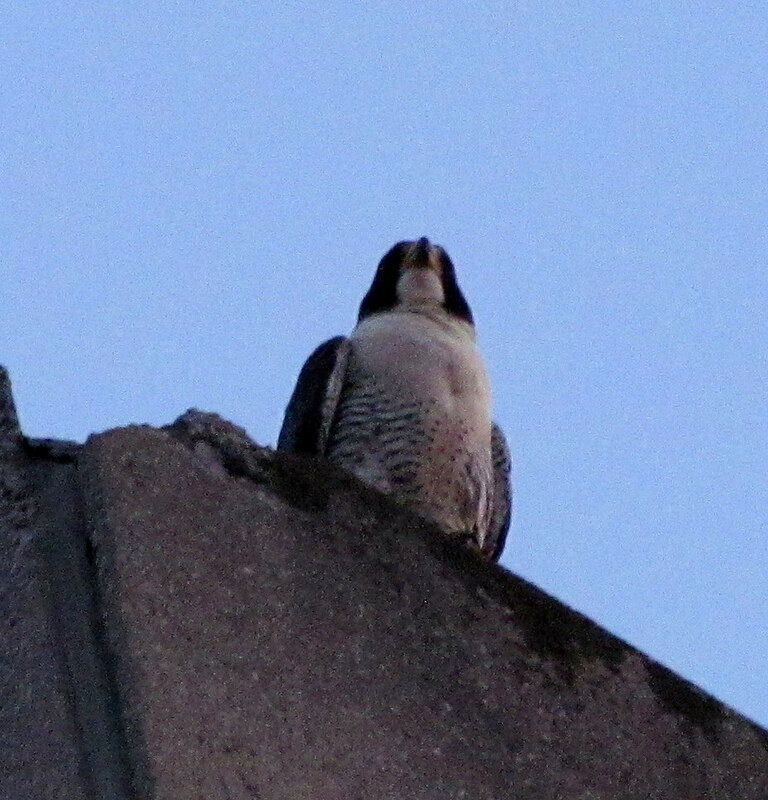 Dot.Ca(DC) was on the eggs when I left the house so I assumed he was still there when we arrived on the Broad St. bridge. We checked around for Beauty to no avail so I suggested we go to the Brighton site(BS) as I don’t get there often and check for Pigott. She wasn’t around when we first arrived and when I got a tweet that DC was relieved by Beauty at the nest box I thought we should wait and see if he showed up. I’ve been wondering if he is spending much time with Pigott lately since he spends so much time downtown. 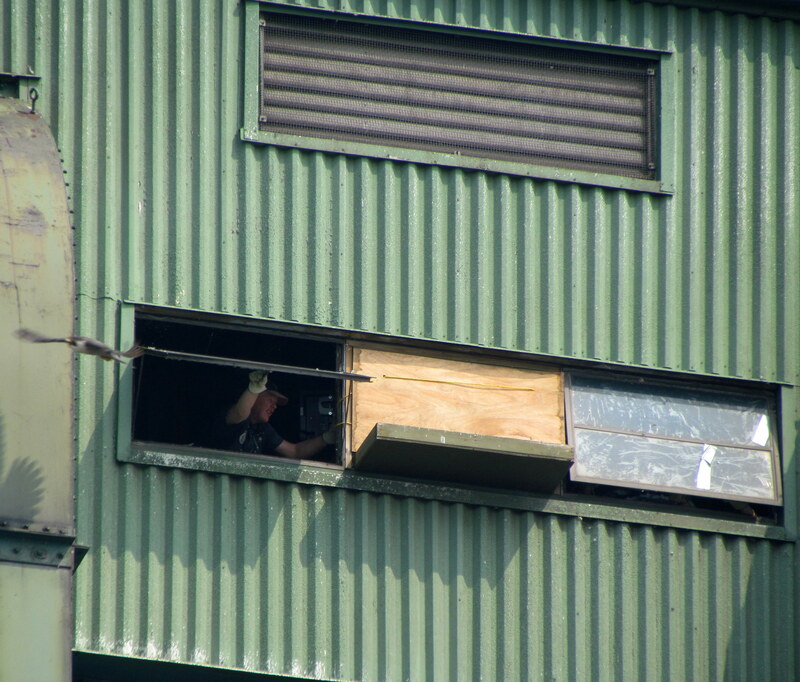 After taking another ride around the building I spotted Pigott on the west end of the vent that is located on the south (back)side of the building. She was leisurely preening and no doubt enjoying the cooler temperatures that arrived last nite after the heat of the last week. 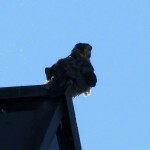 We watched her for a little over a half hour when Lynda caught sight of a Red-tailed Hawk flying in from the southeast. Pigott spotted it too and after taking a quick look she started squawking and took off after it. 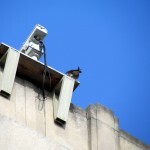 She thumped it a couple times above the building and chased it around the building twice before escorting it to the north and out of the area. 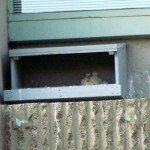 She then returned to the vent and came to rest on the same spot as she was before the altercation with Mr. RTH! I got a tweet that DC was back on the eggs so he obviously wasn’t going to be showing up at BS so we decided to go back to downtown and see if we could find the Beautyful one. We stopped to get a slice of pizza for lunch on the way and parked in front of the Blue Cross Arena on Exchange St. where we were facing the Times Square building and could also see the Crossroads and Wilder buildings. 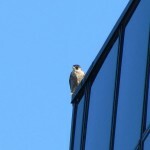 Just as we finished up with our meal Lynda noticed a falcon flying above the Crossroads building. 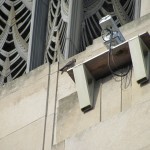 We watched it circle the area above the Powers building and fly west out of sight. Thinking it was Beauty I suggested we drive over to the Frontier Communications Tower since that’s the general direction she flew. She wasn’t there and after checking Kodak Office we left to go back to the Times Square area. On the way I got a call from DebbieH asking if I was around as she was on her lunch break and wanted to join me. We met her by the Broad St. side of the Blue Cross Arena where we saw Beauty up next to the main cam. Deb and Lynda were meeting for the first time and we were joking about how there’s usually a stand down when Beauty wants DC off the eggs. That boy loves incubation duties and I can’t wait to see how he is with his babies. Lynda has a smart phone and brought up the livestream so we could watch as Beauty hopped over to perch on the deck and stare at DC as he looked away. 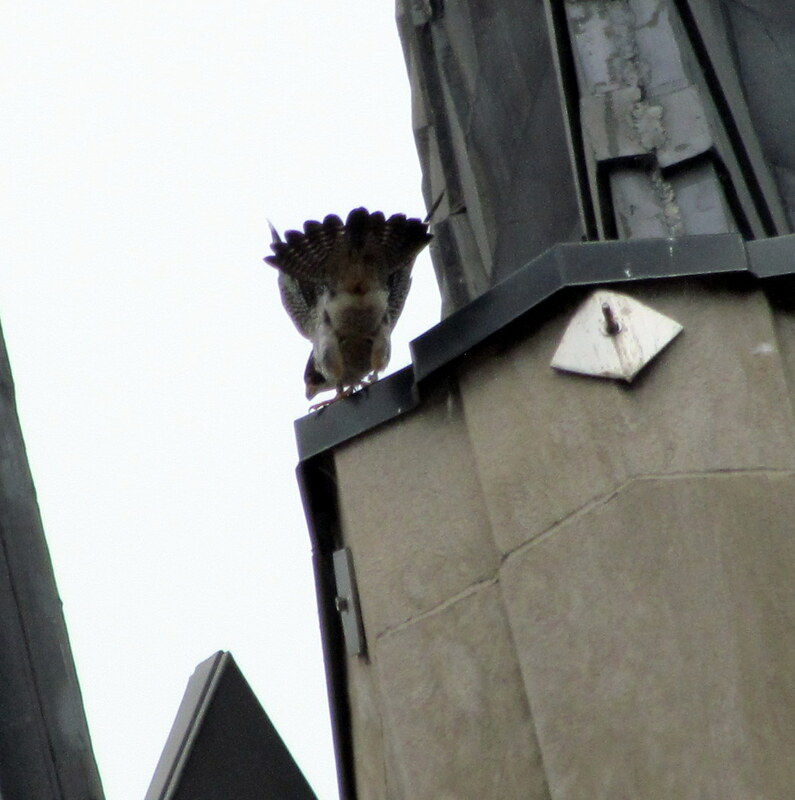 He eventually gave in and left the scrape flying above the Times Square building circling it twice and landing under the southeast wing. 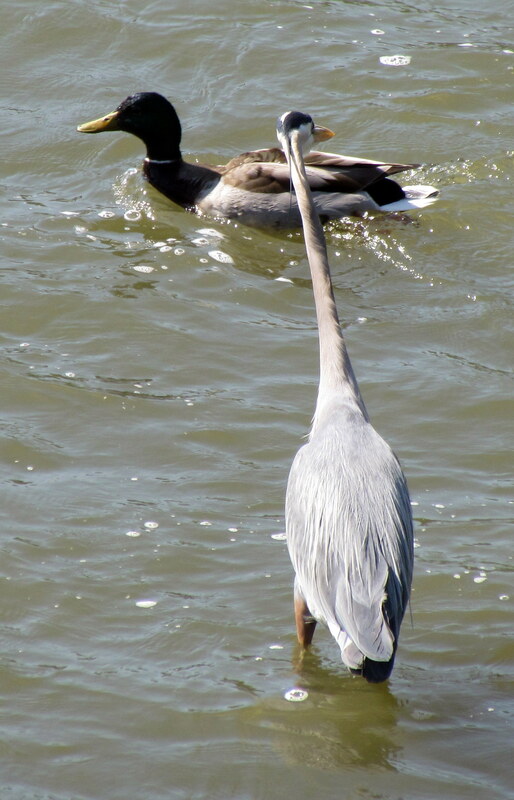 He preened for a bit and then flaired out his tail before flying off to the southwest seemingly going into a stoop before we lost him behind the Democrat&Chronicle and jail. Debbie had to get back to work and it was almost time for Lynda to be leaving for home so she said we could go to BS one more time to see if DC went there. It was an unsuccessful trip for neither he nor Pigott were there. 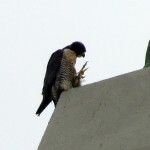 I had a great time with Lynda as I always do and we were both smiling as we ended our watch, for not only had we seen all 3 of our Rochester Peregrine Falcons but we had seen all 3 fly as well! Weather: A beautiful day! Sun, a few clouds, a little bit of a breeze and temps in the 70’s. Humidity way down! 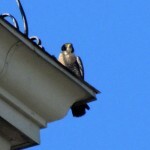 Watcher: Larry O, Dan S & Carol P.
Another successful late afternoon/evening Falcon Watch with all three Rochester Falcons seen. Love when that happens. I would have liked to see #4 over at KP, but no luck. My usual route after work seems to take me to the BS location to check on Pigott first. 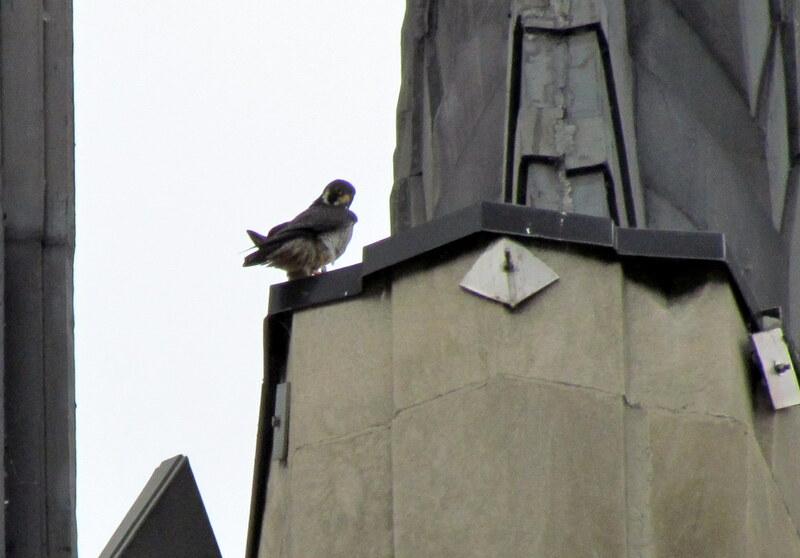 Since other Watchers and the cameras see Beauty and Dot.ca most of the day, I like to put my mind at ease that she is ok. Today I found her on the front (north) side of the building. She was on a windowsill in front of a boarded up window. But, she wasn’t there for long. Pigott took off and circled above me, so graceful. 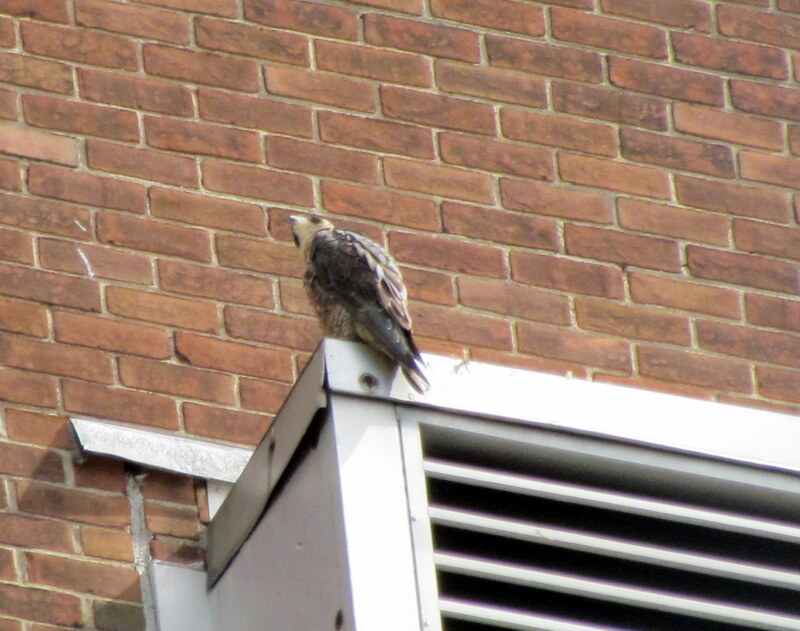 She flew back towards the building and landed on a corner on the north side near the scrape. She was almost directly above me and she vocalized just a little bit. I looked around almost expecting to see Dot.ca fly in, but he was nowhere in sight. She settle down and started to preen. I stayed with Pigott for a little while before deciding to head downtown. I was happy to see her looking so well. Next stop downtown Rochester. My on-line Watchers today were Kathy O, Donna, Ei, Joyce and NT aka NCAFalcons. Thanks everyone! Like I said in my tweet, with all of you letting me know what’s going on at the nest box, there’s no need for me to get a smart phone! lol When I ask a question like “is Beauty in the nest box?”, I get a text back almost immediately! “Yes, she is!” I love it. This was such a problem for us in the old days of watching Mariah and Kaver and their young. We had a really hard time knowing what was going on at and in the nest box, from below. Our biggest improvement was to add radios to the watch so we could call each other, instead of yelling! Now look at us! Thanks to all of you that are helping out. 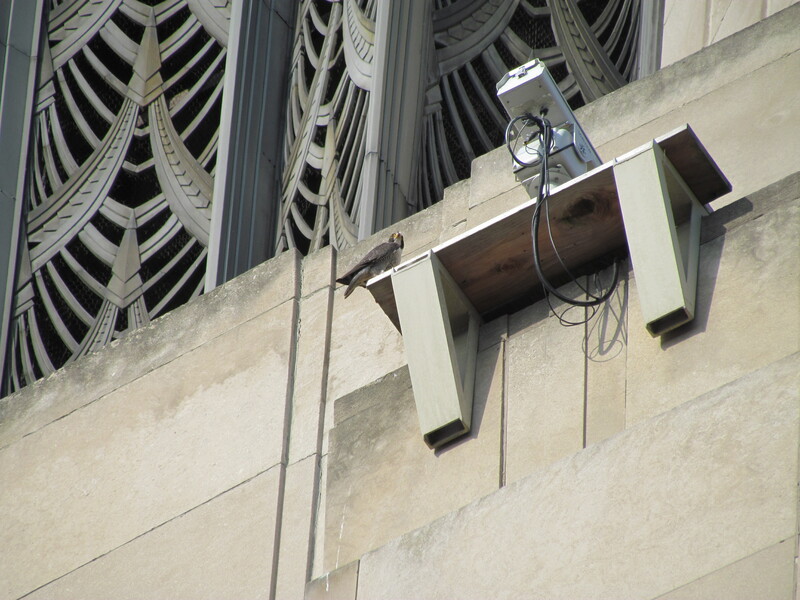 So, I arrive downtown and find out that Beauty is on the eggs and D.C. is on the nest box platform. After parking my car on the Broad St Bridge, I look up to see that D.C. is gone from the NB platform and is now on the base of the SE wing of the TSB above. A text comes through that Beauty is sleeping in the nest box. A true Sleeping Beauty! At 5:10 pm, D.C. takes off and does not return until 6:40 pm, when I spot him up on Camera 4, with Beauty still in the nest box. In between, at 5:20 pm, I had driven over to the Andrew St Bridge to check out the other spots they like to visit. Nothing. Back to the BSB, where I am joined by Larry O. We checked out the area for D.C. No luck finding him. Larry had to leave just before Dot.ca showed up on Camera #4 at 6:40 pm. He texted me that Dan S was out on the bridge. So, I took a few pics of D.C. and then headed up to join Dan for a short while. 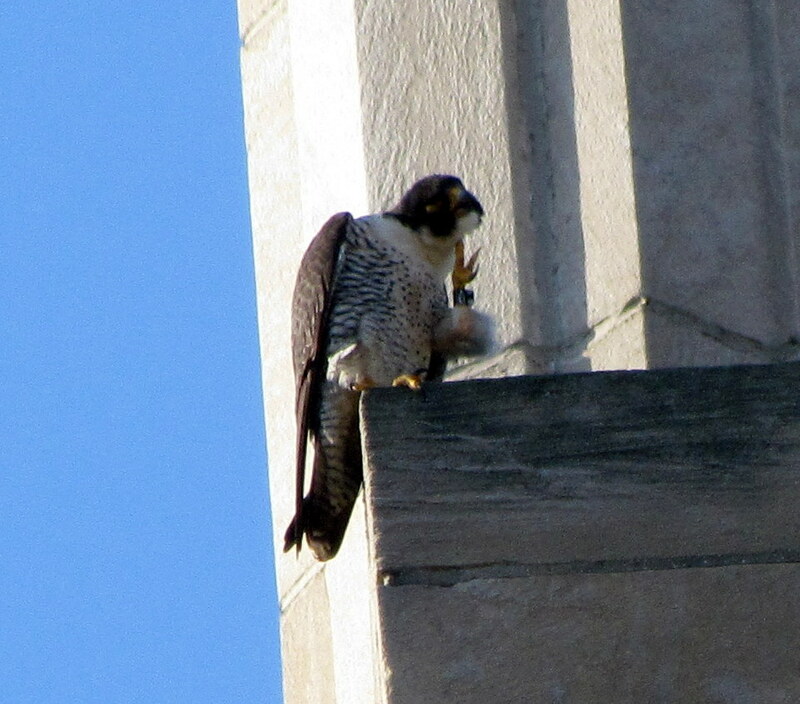 During that time, D.C. entered the nest box and Beauty left. Shift change! At 7:20 pm, I left Dan on the BSB. He wanted me to say hi to everyone for him. 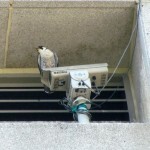 He does not have a computer, so he never gets to check out what’s going on at the Rfalconcam site. My last check on my way home was Kodak Park. 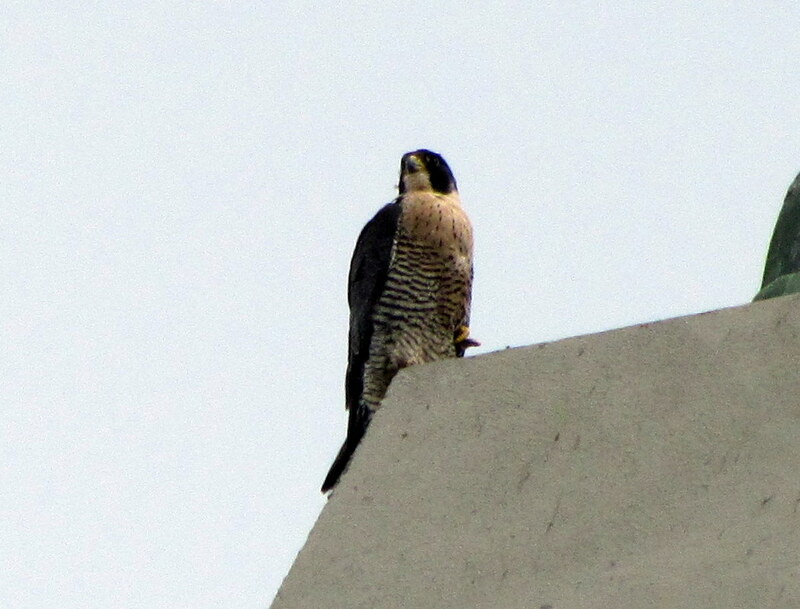 I checked out the area but had no luck finding the sub-adult Peregrine I saw there last Friday. I will definitely keep checking. 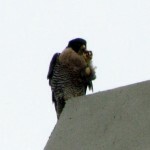 It was another successful Falcon Watch with all three Rochester Falcons seen. Remember to keep your eyes to the sky! There is all kinds of neat stuff going on up there! Todays temperatures were much more comfortable than the last few days with clouds to begin my watch. As the bus made it’s way down Main St. 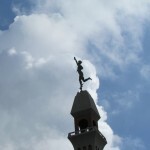 I checked the jail tower,Frontier Communications tower,Widows Walk and the back of the Times Square building. No pefa bumps so when I got off the bus just before 8:00am I walked straight to the Broad St. bridge. 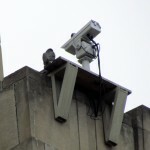 Nothing on the Wilder building,Mercury,OCSR,Xerox or Bausch & Lomb. As I looked down river to the north toward the High Falls area I spotted a bump on a brick stack that is located further down river from High Falls. After zooming the pic on my camera I still couldn’t be sure if it was a falcon or a hawk but it did seem to be perched like a pefa to me. I thought perhaps it was Beauty and I had found her hiding place when I can’t find her as I knew Dot.Ca(DC) was on the eggs since Donna helped me out with that info. Thank you! 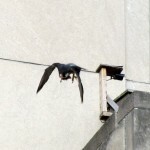 About 20 minutes passed when DC flew out of the nest box and another 20 minutes went by before he returned and landed on cam 4. I couldn’t tell at the time but he had prey with him. 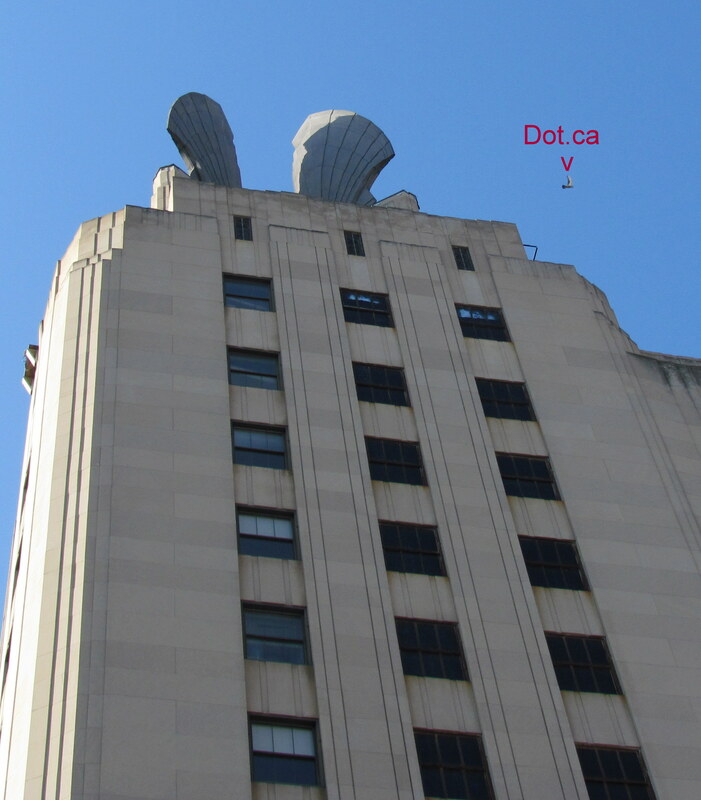 DC flew off a few minutes later, circled above the Philipone building and landed under the northeast wing only to take off again behind the Times Square building out of view. Less than 5 minutes later DC came flying in from the west and landed next to the main cam. I was so hoping he would get back on the eggs as it had been a half hour since he was on them. 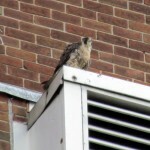 Well he didn’t do that, instead he flew back out again and went behind the building out of view once more before returning to land on the other side of the main cam. I was right below the nest box at this point and my view of things was very limited so I walked back up to the bridge to better keep track of things. I was really wishing the Beautyful one would show up and get on those eggs to rid me of my anxiety about them not being covered for close to an hour at that point. I thought maybe DC was trying to lure Beauty to the nest box by flying around the area cuz he wanted to take a break to eat since he was carrying prey around with him. Next he flew in the nest box with his small bloody morsel and plopped himself near the eggs with it. He soon flew out landed on the roof of the nest box and quickly went back into the scrape and back out again and came to rest under the southwest wing. I blinked and he was gone from there and next thing I knew Donna was texting me that he was back on the eggs! We were both relieved to have him back on incubation duty. Boy he sure had me hopping for an hour. I walked further east on the Broad St. bridge to check that stack which had the bird on it earlier to find it was not there anymore. I went down by the Rundell library at the east end of the bridge and sat down at one of the picnic tables. After an hour I texted Donna to see when DC relieved Beauty this morning and she said at 5:43am, so it had been a 4 hour break for her at this point. I noticed the Powers building was getting it’s windows washed as I peered in that direction and then I stretched my legs out and checked down in the river to see a Great Blue Heron looking to catch some breakfast. 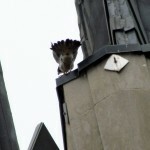 Around an hour later as I looked up toward the scrape I caught DC flying out from the nest box and disappearing behind the Times Square building. I kept my eyes on the nest box area hoping to see Beauty fly in to take over when I got a tweet from Ei that my favorite female falcon was on the eggs. Oy, she had snuck in there on me again! lol I figured she would be in there for a while and DC probably went to see Pigott over at the Brighton site so I decided to end my watch and head down to the bus stop. I was thankful to see DC do some flying as my last few watches didn’t produce any action to speak of and so I left downtown smiling. Weather: The day started out really hot, high 80’s, but after a cold front went through, it was way more tolerable, in the 70’s. Still sunny and warm. Watcher: Kathy O & Carol P.
After getting out of work, I first drove over to the BS location to find Pigott in the shade on the east side of the building. Sitting on a windowsill preening. She looked great. If she laid eggs at the scrape, we will never know. Although we saw them mating and visiting the scrape, that has pretty much stopped now. 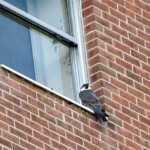 Over the weekend, Dana and I did see Pigott at the scrape for awhile, sitting on the windowsill there. I think it’s been awhile since D.C. has been seen there, although there are recent reports that he has headed in that direction from downtown. After spending some time with Pigott, I headed downtown. On my way there, Kris G informed me that D.C. was on the eggs. So, I started my search for Beauty. Where could she be. Not on the TSB. or the Wilder Bldg. or OCSR. or the Widows Walk. I expanded my search grid to the Andrew St Bridge where I could see the Kodak Tower, the Cross Rds Bldg and the north side of OCSR and ….. there she was! Beauty was on Frontier Communication Tower below the platform on a square box shaped structure she always favored. It had been a long time since I’d seen her there. 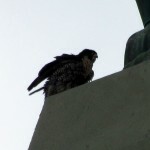 At 5:00 pm, Beauty spread her wings and took off heading south, towards the Times Square Bldg. I followed, but heavy traffic kept me from keeping her in sight. By the time I got to the Broad St Bridge, she was nowhere to be seen. Donna and Joyce verified that D.C. was still on the eggs. First I found some shade down on Aqueduct St, the temps were creeping back up into the 80’s and it was still really humid. Certainly not as bad as it had been over the Memorial Day weekend. Nothing was happening, so I drove up to the Broad St Bridge and parked my facing into the sun. At 6:00 pm, Beauty came flying in from the east (Xerox/Midtown area). She flew over me and up to the nest box. D.C. was out and Beauty was in. Shift change! I had not seen where Dot.ca went, so I went in search. 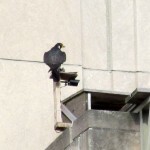 Once I didn’t have the sun in my face, I was able to see him up on the base of the SE wing of the TSB, preening and cooling down from his hours on the eggs. 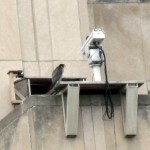 So far, I had all three Rochester Falcons, so it was a good Watch. But, there was one more place I needed to check. 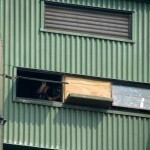 On the way home I stopped to check Kodak Park (KP), hoping for a glimpse of the small Peregrine I saw there last Friday. Kathy O was already there and reported that she had not seen him. I never did post a Watch Report about this did I? Here it is! 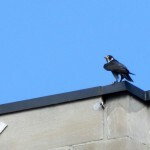 Tiercel spotted at Kodak Park on Friday, May 25, 2012 at 7:30 p.m. Some of you may have heard that I spotted a sub-adult Tiercel (male) at KP on Friday, May 25th around 7:30 pm. Kodak Park is on my way home, so I try to stop there every night. I was hopeful that maybe Archer would go there to recuperate from his injuries. It was a familiar spot for him. 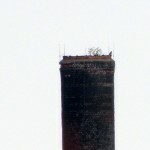 So, imagine my surprise, when I saw a small falcon on the catwalk of the west smoke stack. 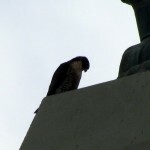 It was windy and warm and the falcon was facing away from me. 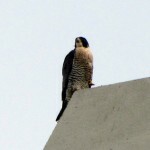 At first I thought, was this a Peregrine or a Kestrel? 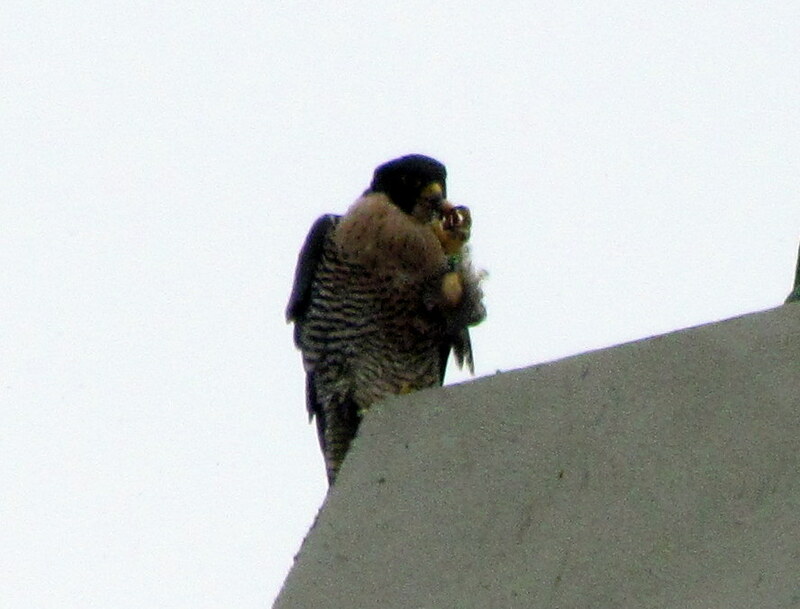 After a better look through my binoculars, I could see that it was definitely a Peregrine, dark hood, white chest. Could it be? Once I put the scope up and got an even better view as the falcon turned towards me, I could see the heavy streaking on the belly and juvie brown feathers mixed in with adult dark gray. Another sub-adult, with almost the same coloring as Pigott. and before you ask, no this was not her. This was a very small male. 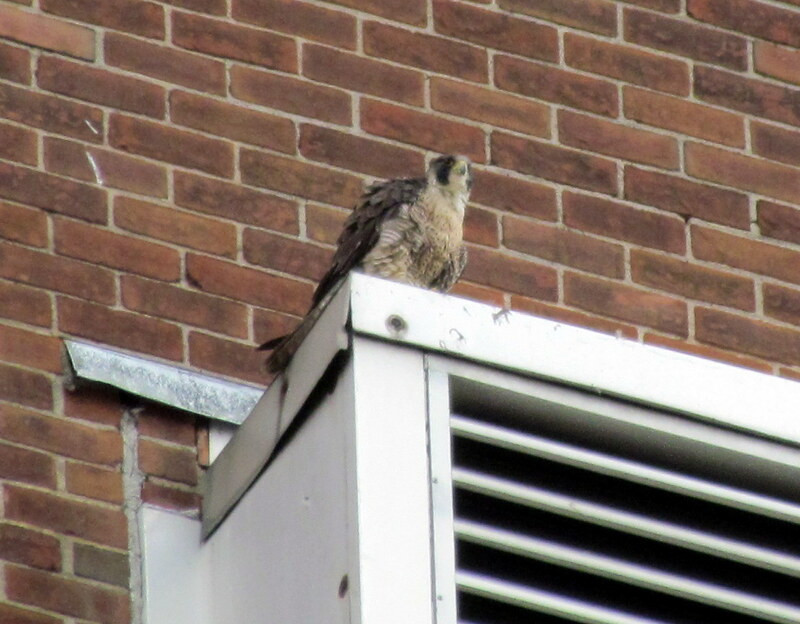 I quickly tweeted out that I had a Peregrine at KP and I was first joined by fellow Watcher Dana and then Joyce and Lisa. 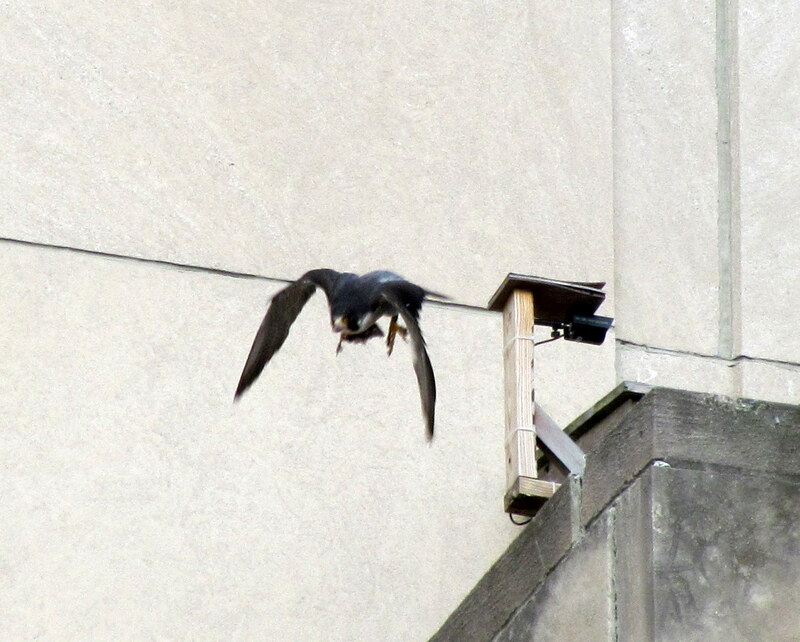 But, before they got there, the tiercel took off heading east. Strong, fast, steady wing beats. He was on a mission or a hunt. Hunt it was! Within a minute, he returned with prey almost half his size. I really couldn’t tell what it was. He carried it up to the black strip on the blue bldg that contained the old scrape used by Unity and Archer. He was very close to it. That’s when Dana joined me. He started to pluck and eat. Through the scope, I could see that he had black/black bands. 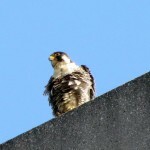 So yet another Canadian Peregrine had made his way down to Rochester. 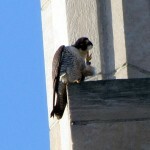 At 8:30 pm, he had eaten his fill and cached the remainder somewhere on the north side of the bldgs where we could not see. 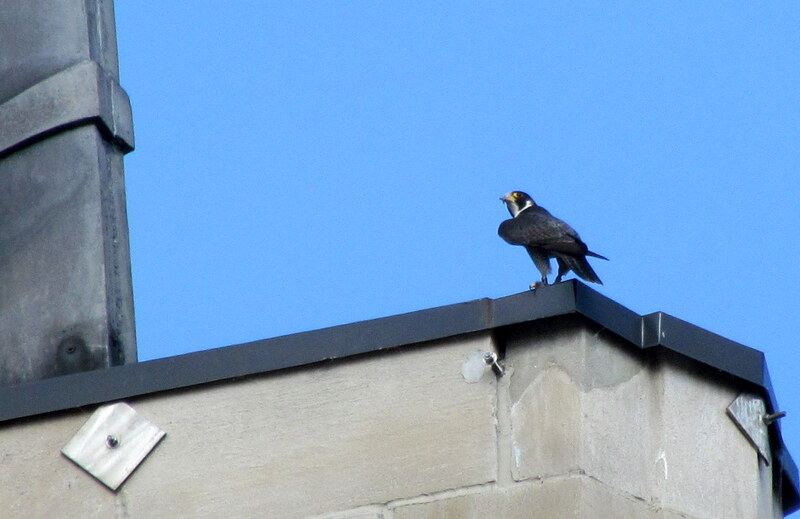 The tiercel returned and flew in front of the blue bldg and back to the east end where we lost him. We assumed he landed somewhere down there, but we were never able to find him. Joyce and Lisa joined us to help try to find him, but no luck. I still check there daily, along with others, but no one has spotted him again. Was he a young male just migrating through? Or will we see more of him? I hope so! 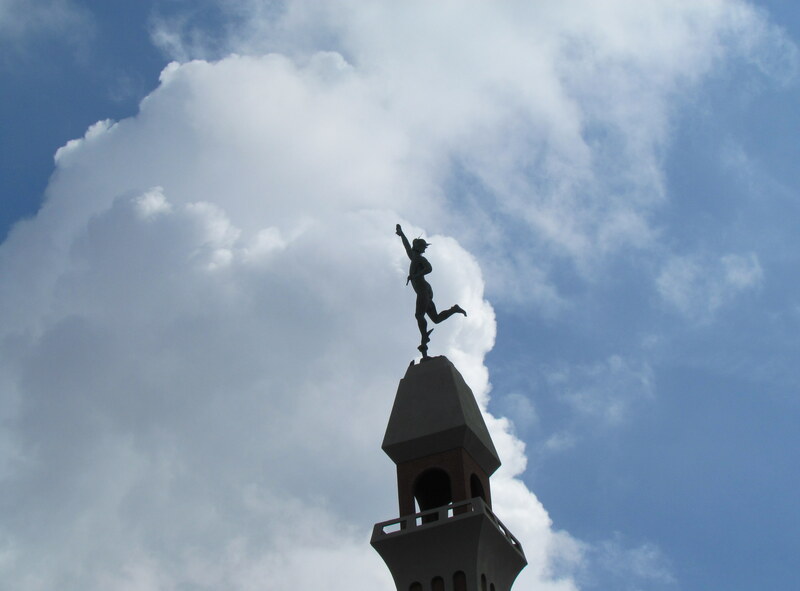 It’s just another reason to keep your eyes to the sky! Well I must say things sure have quieted down on the falcon watching front here in Rochester,NY. I thought I would say a few syllables in case those of you who look for my reports were wondering why you haven’t seen any in a while. I was in Canada 2 days last week and had some festivities over the Memorial day weekend to attend. My last 3 watches produced 1 brief sighting of Beauty on the deck of the nest box last Friday. 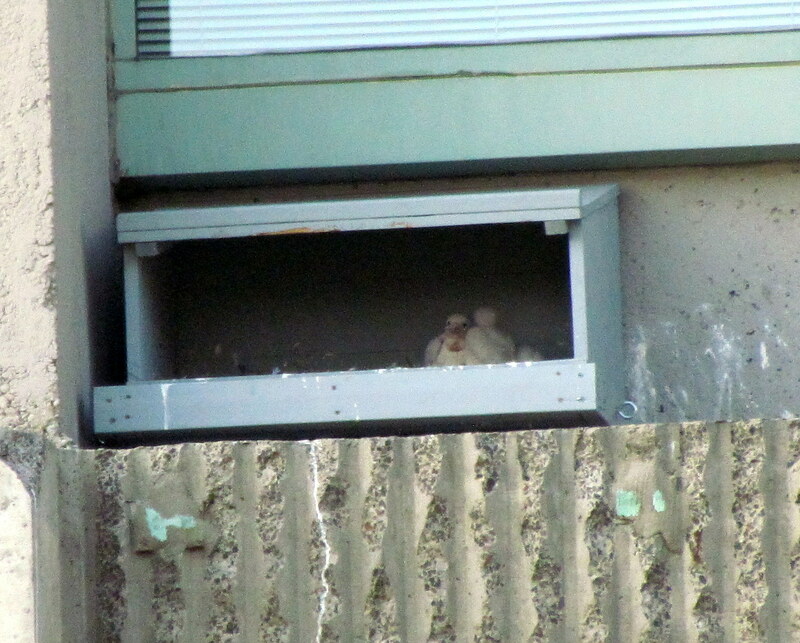 And from the top of the South Ave. garage yesterday I could barely see the bump of Dot.Ca laying on the eggs in the nest box. Today I saw nothing. Pretty exciting stuff eh? I had a chance to see them this morning as Beauty left the nest box and Dot.Ca relieved her of incubation duties but I missed it cuz LarryO and Cleo stopped by for a few minutes. The switch was made while Larry and I stood on the Broad St. Bridge chatting and not paying attention. Such is the life of a falcon watcher-you can sit for hours staring and the moment you look away bam that’s when they do something. Oh well, better luck next time as they say! The heat yesterday(low 90’s) and today(85 when I left downtown) were too much for me to stay much more than a couple hours. A cold front is coming through sometime today and the temperature for the rest of the week looks outstanding- in the 70’s so I will no doubt stay out watching a bit longer. I can handle that and hopefully the birds will be a little more active too. Nature did come to the rescue providing other things to entertain me for example yesterday I was treated to a swan family and several goose families. And today I watched a crow catch a crawfish in the rocks of the Genesee river and proceed to battle it without being grabbed by it’s claws. The crawfish finally succumbed to the relentless poking and wrestling of this crow. The crow filled it’s beak with this protein enriched shellfish and took the morsels back to it’s nest in Aqueduct park to feed it’s young. So you see there’s always something to make you smile when nature is involved! Let me just start by saying this was the best falcon fun I’ve had to date. From seeing some tandem flying at the Burlington bridge to holding a real live eyas while it got banded to watching a couple of fierce moms defend their nest and seeing one of my favorite pefas- Quest again. Holy flying falcon I had the time of my life and I owe Joyce a great big thank you for taking me with her for this adventure. We started out Wednesday morning for the Burlington Bridge banding at 10:00am. 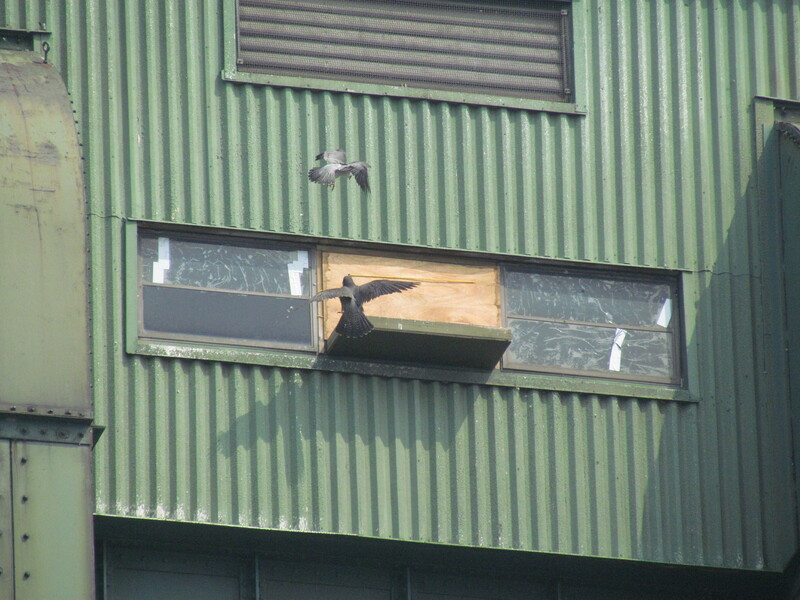 The resident pair-Cirrus and MacKenzie were both present and in defense of their nest site as Mark Nash placed a board between them and the banding crew. These two gave quite the show and quite a start to our trip! 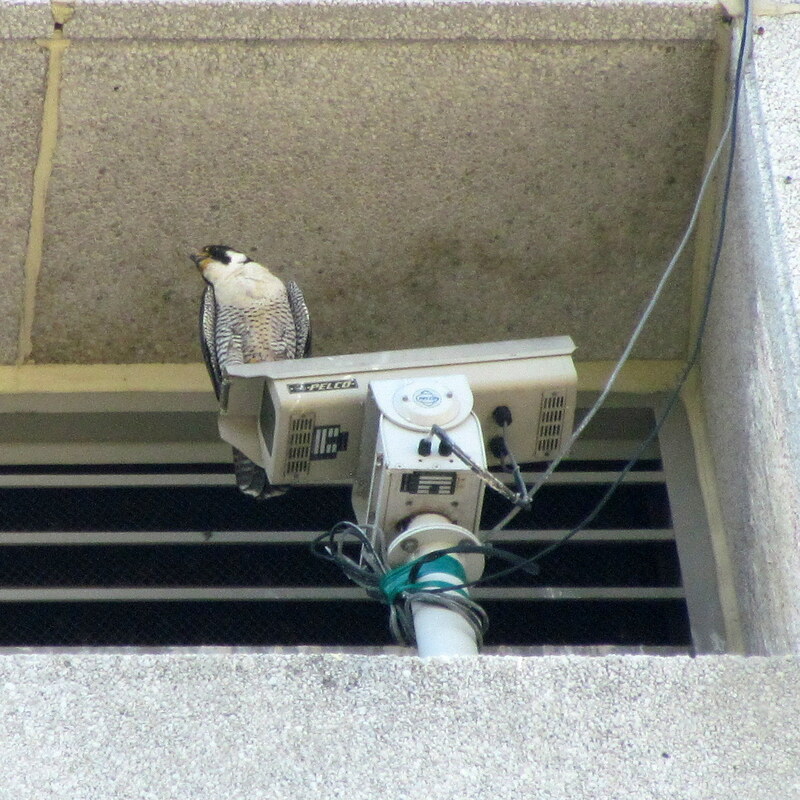 Our next stop was the Sheraton in downtown Toronto where we saw Rhea Mae and Tiago sitting on the ledge 43 stories up and inside at the banding Joyce got to hold Marlee, the first male to be banded. We also met up with Kathy, Dana and Carol who rode up together. Two males named Marlee and Cosmo and two females named Journey and Fef were banded at this site. The 5 of us Rochester falcon watchers decided to go see Quest when we left the Sheraton. 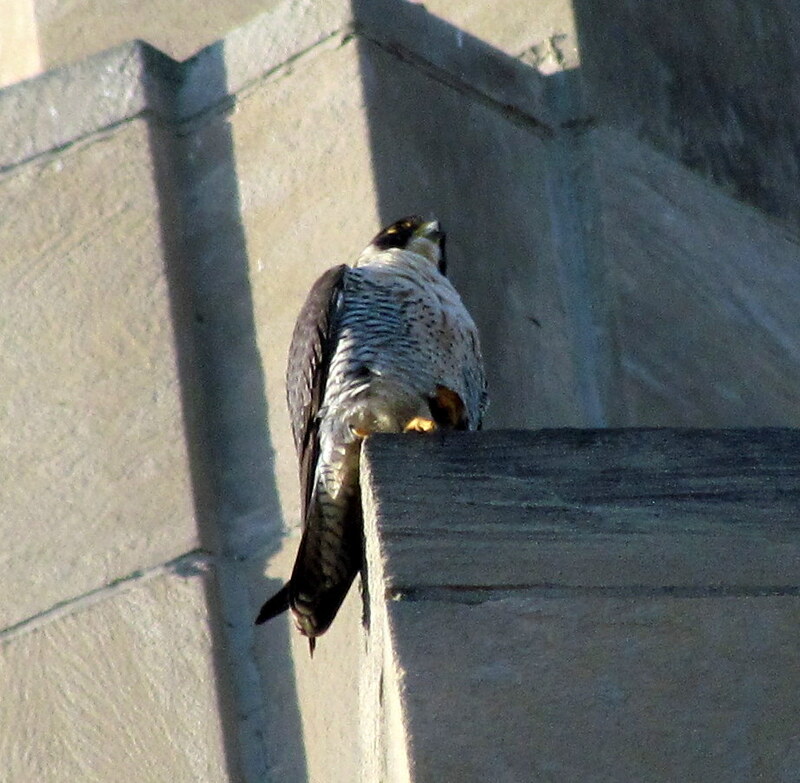 Joyce and I arrived a little before the rest to find Quest on top of the Harlequinn building keeping an eye on her babies across the street in the nest box. Kendal didn’t show up until much later when Joyce and I returned to the site after going for a bite to eat. The other ladies had left for home and missed him. This was the end of day one for Joyce and I as we got a hotel room across the street from the Yellow Pages building where Linn and Reuben reside. In the morning we were lucky enough to see both pefas present and a food exchange made.We didn’t spend much time with them for we had to get to the Canada Square site for their banding at 10:00am. Traffic was horrendous as usual in and around Toronto and we were almost an hour late but lucked out as they were just getting ready to go up and extract the eyasses from the roof. 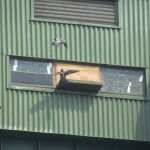 Mark Nash had brought a nest box to place up there as they were nesting on the roof without the benefit of a proper home. 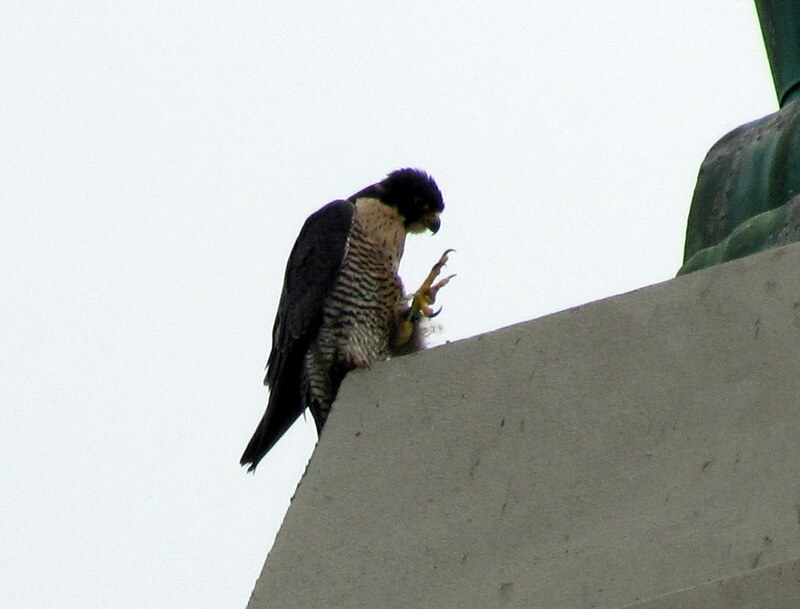 We watched from about 6 feet away as Haven(named by CPF) the unbanded female did her best to defend her babies and nest. Wow what a show we got here as well!There weren’t many people at this banding and what a surprise when Marion Nash called out MAK would you like to hold an eyas? Are you kidding me? Of course I would, and so I held Solar whilst he got banded.After this banding we left for the next one in Etobicoke at the Sunlife building where Jack( dad to Dot.ca) and new female replacing Angel the infamous O’Connor reside. We caught one brief glimpse of him as the males usually don’t get involved with protection during banding festivities. They protect the territory and leave the nest to the females and in this case left it in good hands or shall I say talons. O’Connor proved to be just as fierce and fiesty as Tracy described her on many occasions. She pulled a net out of the hand of Mark Nash and thumped a guy on duty twice on the top and back of his head. He should have been wearing a hard hat so that he wouldn’t have lost any blood from the experience. Sheesh! Kathy known to us on the forum as Carly a regular watcher at this site said she heard him yell OW! all the way down on the street some 200 ft. There were 3 females and 1 male for this site and one heck of a show put on by Miss O’Connor, who by the way is quite big and beautiful! After helping Mark and Marion load their equipment into their car we said our goodbyes and left for the states. Joyce wanted to check the Niagara Gorge before it got dark on our way home. Unfortunately the mist from the falls and the lack of light made for very poor camera conditions but we did see the babies and 1 adult in the scrape. All together on this 2 day excursion Joyce and I saw 13 adults and 22 eyasses for a whopping grand total of 35 Peregrine Falcons. I’d say that’s enough to make anyone smile! I had the good fortune of having the use of a vehicle this morning and so I took full advantage of it. I landed on the Broad St. Bridge(BSB) just before 8:00am. After a look around and not seeing a pefa I contacted Donna to confirm that Beauty was in the nest box on her eggs. She’s always happy to help and I appreciate it tremendously! Having the use of a vehicle afforded me the opportunity to go check on the Brighton Site(BS). Since I didn’t see Dot.ca(DC) downtown I thought perhaps he was hanging out there with Pigott. I didn’t find him but I did find Pigott on the front of the building(north side) 4 windows down perched on a ledge with her back to me. She did turn her head so I could see her very cute face! I didn’t stay long since DC wasn’t around returning to the BSB and finding out a switch had been made in the scrape while I was gone. DC was now on the his eggs. I drove down to the hole(Aqueduct St.) to see if Beauty was on the Wilder building or Widows Walk. As soon as I turned onto the street I looked up and could see the Beautyful one perched near the northwest corner of the base of Mercury a place that can’t be seen from the bridge. After 15 minutes Beauty managed to bring up a sizable pellet making room to eat cached food she had up there. After her talon licking good meal she had a poop for herself and just relaxed for a bit with a full crop. Beauty flew off Mercury after over an hour spent there and went to the deck near the main cam to patiently wait for DC to give up his spot in the nest box on their eggs. He wasn’t budging so she went into the nest box to be more convincing to him. 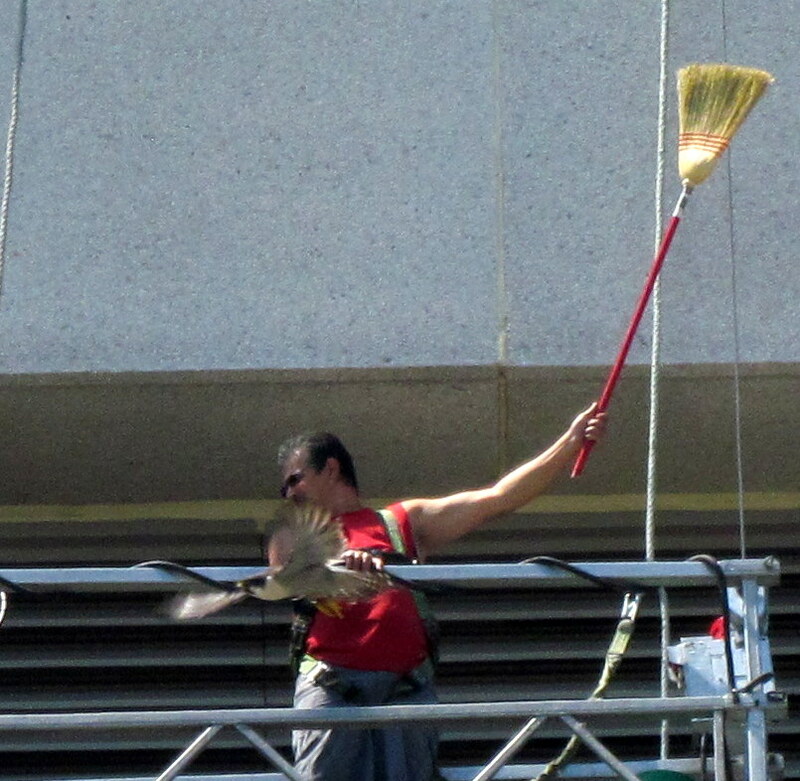 DC finally gave it up and flew the coop flying behind the Times Square building to the Widows Walk flying off seconds after he arrived to the south. 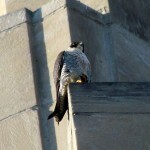 I had to be on my way at this point but I was smiling for I had seen all 3 of our fabulous Rochester Peregrine Falcons! Weather: Sunny and warm. Temps in the 80’s. Cold front went through late afternoon with rain, wind and cooler temps in the 70’s. Watcher: Dan, Kathy O, Brian H, & Carol P.
Boy, do I wish there was more time in the day! So many pictures to go through, so many things to report. Remind me to tell you the story of Dot.ca and the Crows! Oh, well. Here’s what happened this afternoon. I arrived at the BS location at 4:00 pm. Traffic is much more manageable now that the Lilac Festival is over. They had incredibly nice weather for the festival this year, but due to earlier warmth and then freezing, most of the lilac bushes were lilac-less. But, even without the main attraction, the flowers and their incredible fragrance, a fun time was had by all that attended. OK, back to the report. I circled the building, checking all the windows and roof lines and finally found Pigott sitting on a window sill on the east side in the shade. Couldn’t blame her, it was another very warm day in the 80’s and the sun was intense. I found a spot to park my car and settled in to watch her. 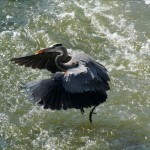 The bright sun on her back showed me a mixture of juvie and adult feathers. 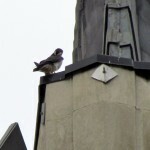 She has a very dark head and her back has a combination of dark chestnut brown and dark gray feathers. 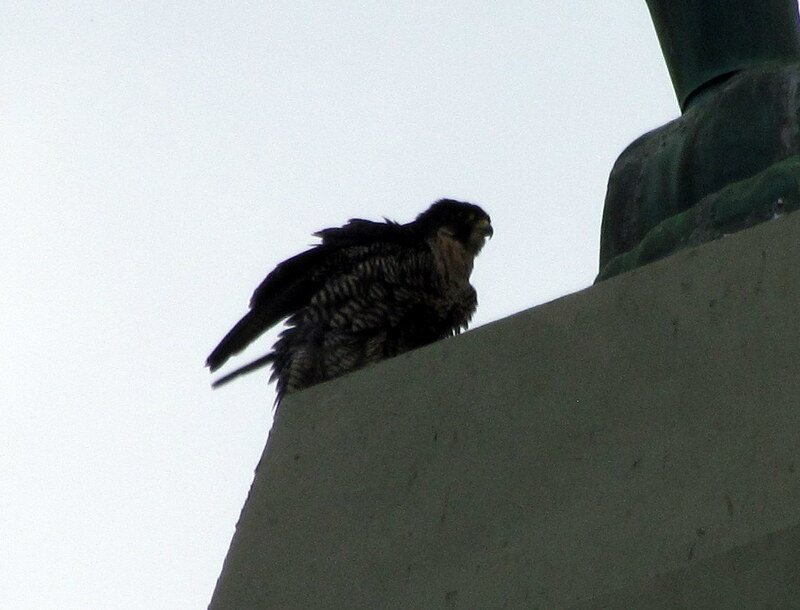 Soon she will have the steel gray and white feathers of an adult. It always amazes me to see this transition to adulthood. After awhile, I decided to head downtown to check on Beauty and Dot.ca. 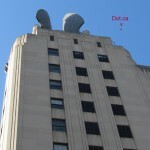 Brian H was there and reported seeing both Beauty and Dot.ca flying together above the Times Square Bldg. I love to watch them fly. 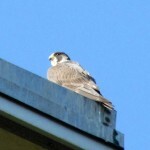 Someone reported that Beauty was back in the nest box and that she was “chatting” with someone above her. I tweeted that it was not Pigott since she was quietly preening here at BS. OK, time to go. When I arrived downtown around 4:40 pm. Beauty was inside the nest box and I couldn’t find Dot.ca, so I drove around looking for him. No luck, so I parked on the Broad St Bridge and was soon joined by Brian H. We moved to the south side of the bridge and watched the cold front move in. Very dark black clouds were moving our way and the winds were picking up. Rain was coming and slightly cooler temps. The river below was teeming with life. Gulls, ducks, a Great Blue Heron and a turtle, sunning itself on a rock. 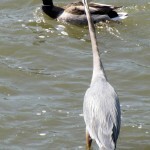 We saw a gull flying over the shallow water, chasing a fish that thrashed below him. I looked for momma duck and ducklings but could not find them. They had been out last night along the east bank of the river on the north side of the bridge. We saw Beauty take off from the TSB, at first I thought it was DC, but he was in the nest box, so it was definitely Beauty. She flew south, over the Blue Cross Arena and just past the jail communication tower. We watched as she circled back, now heading north. That’s when a small Kestral zipped in and started letting Beauty know she was not welcome. He dove on her a few times, which did not faze her at all. She continued towards the TSB with her little shadow following. That is until a Crow decided to get mixed up in it. 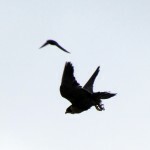 The Crow flew past Beauty and went after the Kestrel! Well, the Kestrel wasn’t going to have any of that. 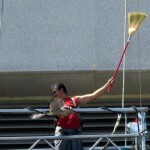 He flew after the Crow! Chasing it north, past the TSB. By that time Beauty had landed on the platform in front of the nest box, with Dot.ca inside, over the eggs. 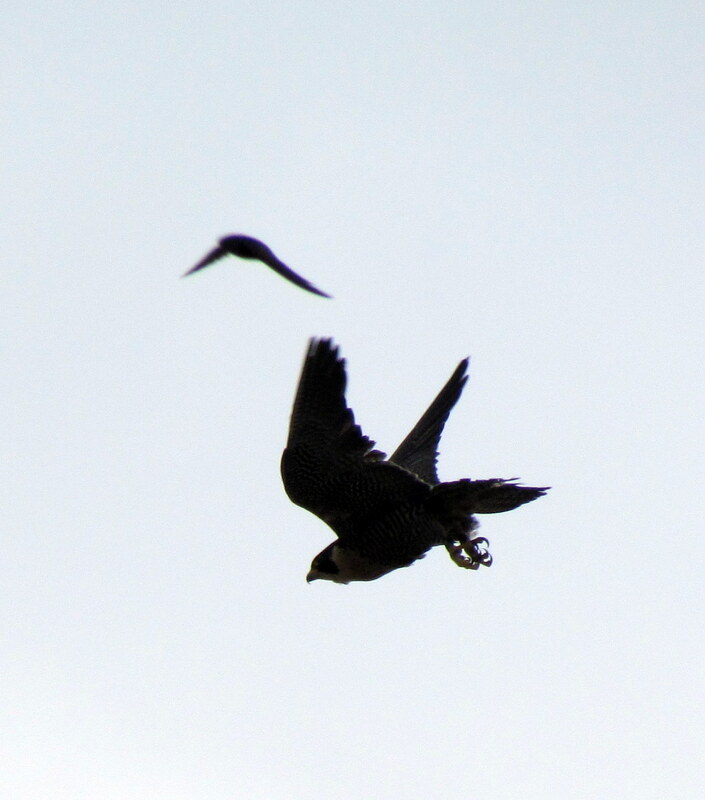 Soon after she landed, the Kestrel returned and started diving on her. Again, she wasn’t much bothered, more annoyed. After a few passes, the Kestrel gave up and flew off. Not sure where he came from or where he went. 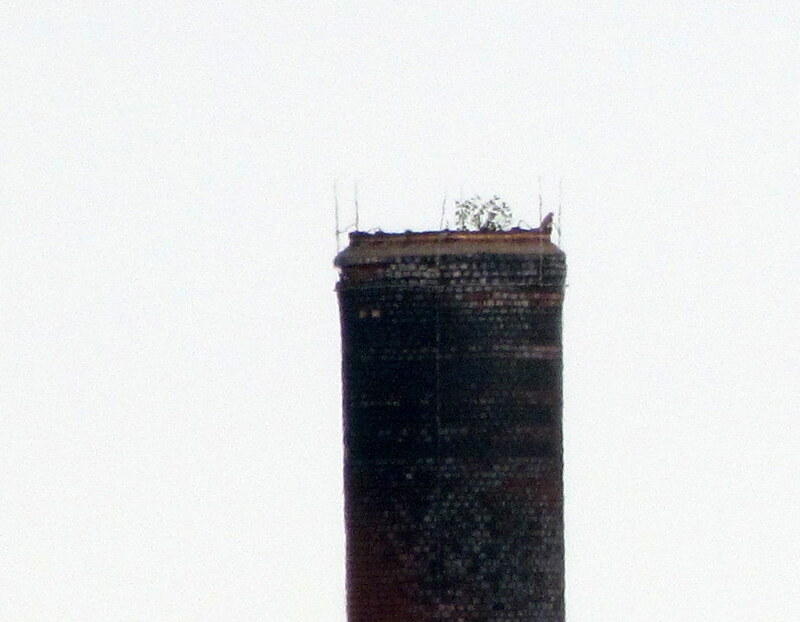 Could there be a Kestrel nest somewhere nearby? The cold front finally arrived and it started to rain. Brian and I got into my car and I took him home. He had been out in the heat for quite awhile today. I returned to the Broad St Bridge and sat in my car in the rain. Kathy O arrived and joined me in my car. 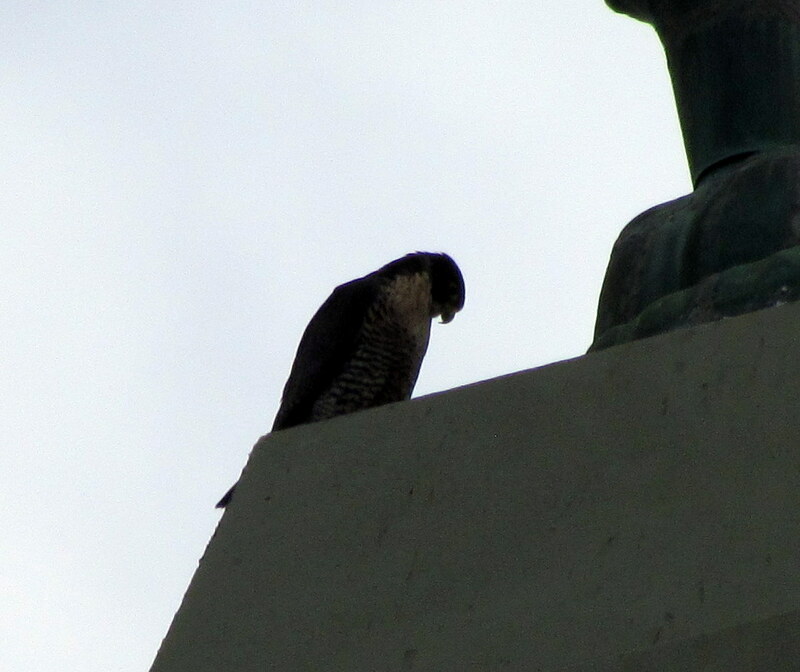 We watched for about an hour, but neither falcon moved. 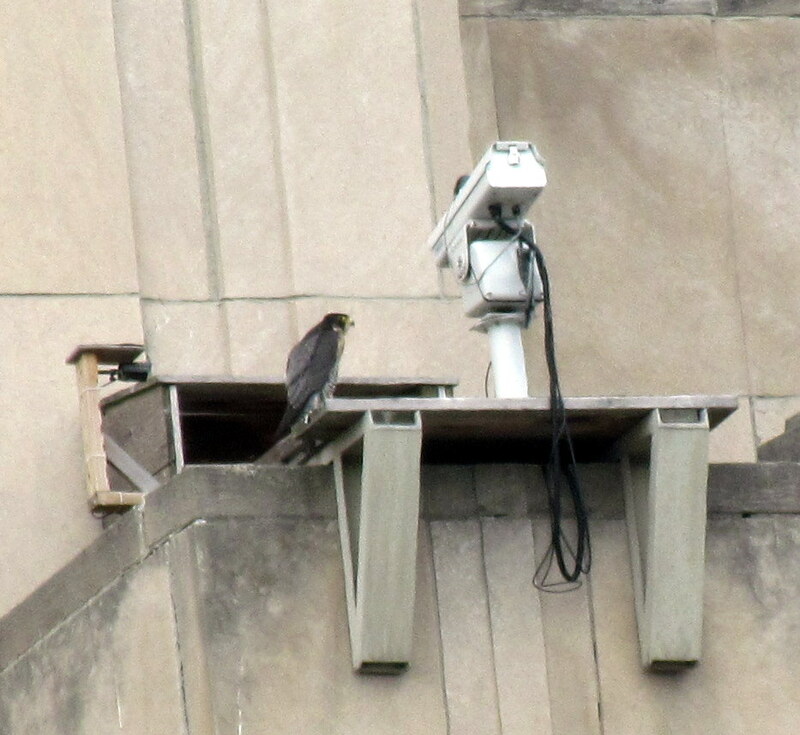 At this time, Beauty was in the nest box on the eggs and Dot.ca was on the left side of the platform keeping guard. At 7:00 pm, we decided to call it a day. Just as we were about to leave, Dan S arrived. We let him know what had happened and said our goodbyes. On my way out, I stopped down on Aqueduct St. and watched Dot.ca on the platform. The rain had almost stopped and he was moving around a bit. At 7:15 pm, he took off, heading south east. I waited to see if he would return with food, but he never did. It was time for me to go. 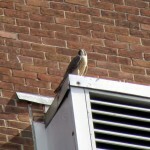 It was a good day today, with all three Rochester Falcons seen! Remember to keep your eyes to the sky. This way you’ll be prepared when the rain moves in! 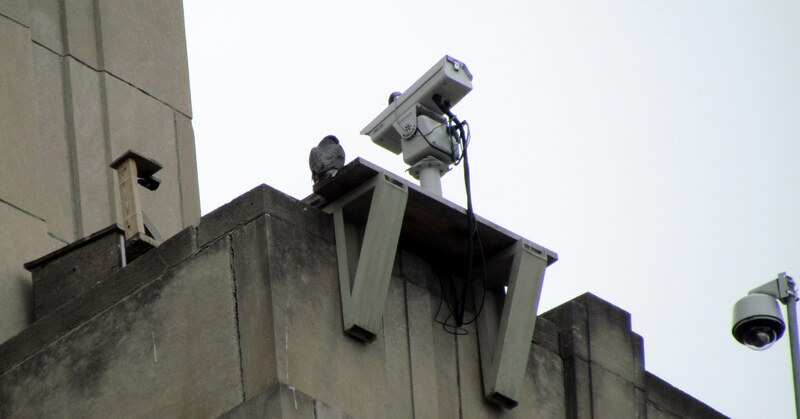 As I approached the Times Square building after getting off the bus around 7:45am I spotted DC on the northeast corner just above the nest box and well. 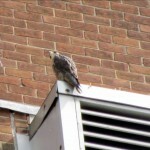 15 minutes later he flew off and went to the nest box briefly then shot back out flying above the Wilder building. 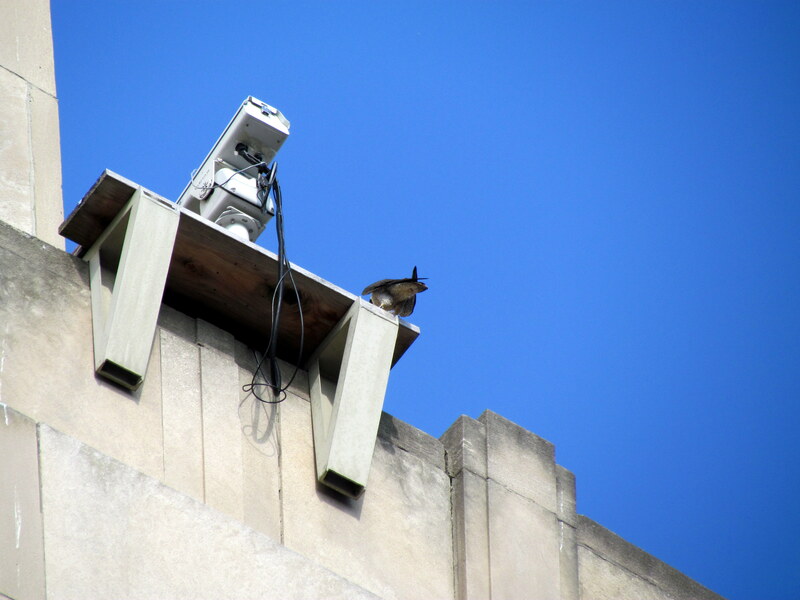 Half way back to the Times Square building he spotted a Starling and stooped on it only to pull back before running into the Phillipone building! Sometimes you watch these birds with your heart in your hand because of their daring escapades. DC then landed under the northwest wing. After a 15 minute perch he flew off to the northwest over Widows Walk(WW) and out of view. KathyO came by and asked if I wanted to ride over to the Brighton Site (BS). Dana had tweeted that DC was over there but when we got there he was gone and Pigott was on a northwest corner in the front of the building. We didn’t stay long returning downtown where I spotted Beauty on the northwest corner of the Crossroads building. 20 minutes later the Beautyful one flew off and ended up on the northwest corner of Widows Walk out of the sun which was heating things up quickly this morning. We couldn’t see Beauty and thought she left but she may have gone in farther where we couldn’t see her. Kathy left about 10am and I stopped to check the river before going down to the hole(Aqueduct St.) to find some shade. 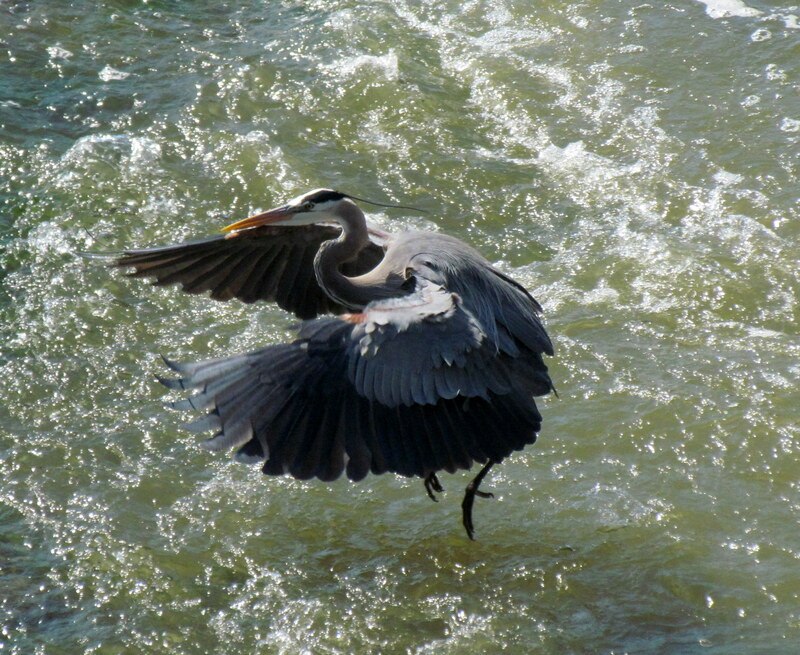 I fpund a Great Blue Heron fishing and captured a pic of it flying from one spot to another. I hung out a while longer and decided to go home and get out of the heat. Although it was a short watch by my standards it was a good one that made me smile!